We all know that Houston is BIG!� Like, plan Buccee’s, Cracker Barrel,�and�Whataburger stops when you are visiting your friends across town big.� But, when you live here you can forget how good we have it.� If you need it we have it – at just about any time of the day.� When it comes to food we are more than covered.� From my house alone I have at least six grocery stores in the rotation.� So, why was I surprised when I started researching Houston Farmers’ Markets that we have over 30!? Fresh, local food is at our fingertips in an almost embarrassing abundance.� Sure, some of our Houston Farmers’ Markets are only open certain weekends of the month but if you look at the map above and check out the spread of little green farm icons we have a wealth of opportunity to not only support our bodies with all this fresh produce and goods but our local communities by supporting these small businesses. 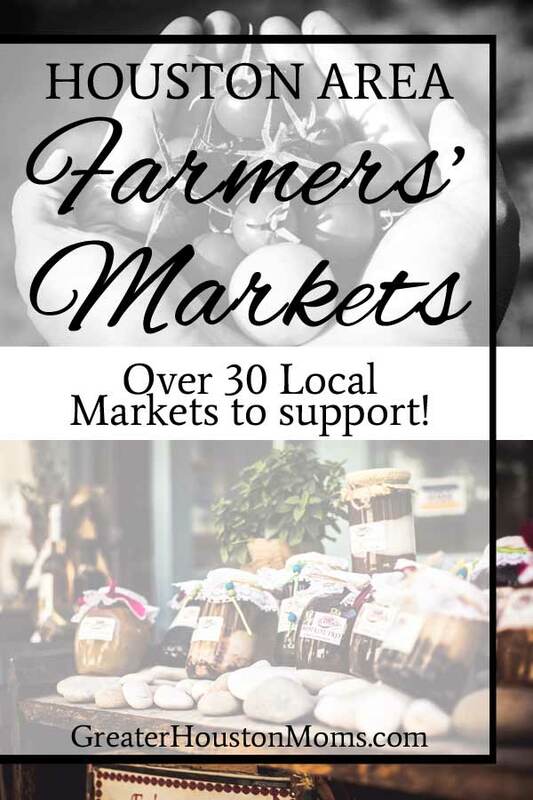 Check out the map and find your�friendly neighborhood farmer or artisan.� You will find far more than carrots and beans at a Houston Farmers’ Market.� You will find hand-milled soaps, small batch oils, tamales, pretzels, and more.� It is worth exploring a few to find a good fit for your needs. We have added the full list to our Shop Local Directory page but have copied them here too, for your�convenience!� Now, go shopping! 2619 Polk Street Open: Sundays, 10 a.m. to 3 p.m.
2520 Airline Dr. Open: Daily, 6 a.m. to 8 p.m.
3300 Chimney Rock Open:�1st and 3rd Sundays from noon to 4 p.m.
901 Bagby St. Open:�Wednesdays, 11 a.m. to 1:30 p.m.
1020 Marina Bay Drive, Clear Lake Shores Open:�2nd and 4th Saturdays�9 a.m. to 1 p.m.
2800 Navigation Blvd. Esp. – Houston Open: Sundays 10 a.m. to 2 p.m.
14710 Grisby Rd. Open:�Every�Saturday 9 a.m. to 1 p.m.
938 Wakefield Dr. Open:�Every Saturday 9 a.m. to 1p.m. 16902 Bridgeland Landing Dr.,�Cypress Open:�2nd Sunday of every month from 12:30 to 3:30 p.m.
1315 21st St. – Galveston Open:�Every Sunday 9 a.m. to noon (June – Sept.) or 1 p.m. (Oct. – May) & Thursday 3 to 6 p.m.
Grace UMC located, 1245 Heights Blvd. Open: 1st Saturday of the month, 8:30 a.m. to 1:30 p.m.
16327 Lakeview Dr. – Jersey Village Open:�Every Sunday noon to 3 p.m.
8 N. Main St., Kingwood Open: 2 to 6 p.m. every Thursday�during standard time and 3 to 7 p.m. during daylight savings time. 8601 Chimney Rock Open: Saturdays 9 a.m. to 1 p.m.
10900 Eagle Dr.,�Mont Belvieu Open:�1st Saturday each month 8 a.m. to noon. 5400 Griggs Rd Open:�2nd and 4th Saturdays 9 a.m. to 1 p.m.
4030 Willowbend Blvd Open:�Tuesdays 3:30 to 5:30 p.m.
1318 Sul Ross St. Open:�Saturdays 10 a.m. to 2 p.m. The intersection of FMs 1488 and 1774 Open:�1st, 3rd and 5th Sundays of the month from 11:00 am to�3:00 p.m.
10503 Westheimer Rd. Open:�Thursdays, 3 to 6 p.m.